Photo by Bryce Forbes. The Mount Royal men’s and women’s hockey teams enjoyed a $1.2 million dressing room overhaul and addition. For the first time in 10 years, the Cougars women’s hockey team will finally have a room to call their own. 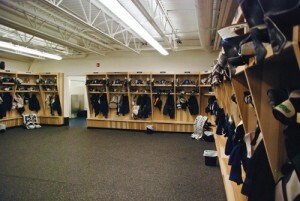 Mid-January, players had access to their new dressing room at the Flames Community Arenas. Previously, the women’s team had to keep their equipment in a storage room. But after renovations to the arena, they now have their own place, which women’s head coach Scott Rivett calls “one of the nicest set-ups for a hockey program in Canada.” Both hockey teams received identical new dressing rooms. each with 26 lockers, one for each player. In addition, it has a men’s change room, coaches office, therapy room and equipment room. “Whenever you get an investment like this, it’s a concrete example of commitment to the program, commitment to excellence and as a head coach, I couldn’t ask for more support,” said Jean Laforest, men’s hockey head coach. The women’s team is also feeling the support from administration. “As much as we love carrying our equipment back and forth, it’s nice to know that we have a home,” said defenceman Megan Price. “It kind of feels like we are a little bit spoiled,” added team captain Chrissy Hodgson. “It’s nice to now come in and not have to carry our equipment to the dressing room and we feel like we are more involved.” The dressing rooms were part of a $17-million renovation to the arena, which included a new ice surface. Funding for the project came in the form of $5 million each from both the City of Calgary and Province of Alberta. The federal government pitched in $1 million and the Calgary Flames Foundation chipped in another $1 million for naming rights. Mount Royal University partnered up with three other sponsors for another $1 million for use of the ice. Mount Royal recreation manager Chris Dawe assured students the money used by the school will not come from the students. Fundraising brought the remaining money together. Dawe estimates the cost of the two rooms at $1.2 million. Dawe also noted that with the addition of a third ice surface, Mount Royal students other than those on the hockey teams would have increased access to the rink in the form of intramural sports and physical education.